Permanent Rubine is a transparent, bluish red pigment with high tinting strength. Although not absolutely permanent, pigment PR184 has very good lightfastness and is considered superior to other comparable transparent red pigments. Permanent Rubine has no acute toxicity. Permanent Rubine is often used as a principal component of magenta in process color printing. It replaces the widely used pigment Lithol Rubine (PR57:1) in applications where lightfastness is paramount. 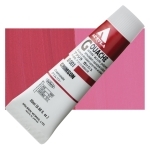 Permanent Rubine F6G, Rubine Red, Permanent Magenta.